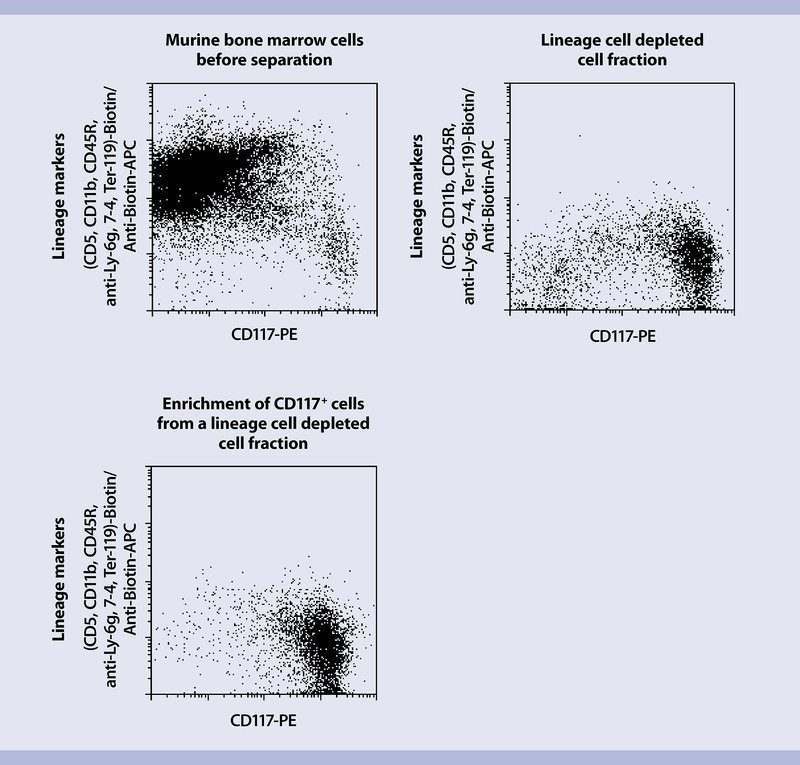 In this application protocol, we describe the depletion of murine lineage cells from bone marrow samples, viral transduction of the remaining bone marrow cells, and their phenotypic analysis using flow cytometry. PE buffer: Phosphate buffered saline (PBS), pH 7.2, and 2 mM EDTA. Keep buffer cold (2–8 °C). Prepare a solution with phosphate buffered saline (PBS), pH 7.2, and 2 mM EDTA. Keep buffer cold (2–8 °C). Prepare a solution containing phosphate-buffered saline (PBS), pH 7.2, 0.5 % bovine serum albumin (BSA), and 2 mM EDTA by diluting MACS® BSA Stock Solution 1:20 with autoMACS® Rinsing Solution. Keep buffer cold (2−8 °C) and degas before using. ▲ Note: EDTA can be replaced by other supplements such as anticoagulant citrate dextrose formula-A (ACD-A) or citrate phosphate dextrose (CPD). BSA can be replaced by other proteins such as respective serum albumin, respective serum, or fetal bovine serum (FBS). Buffers or media containing Ca2+ or Mg2+ are not recommended for use. 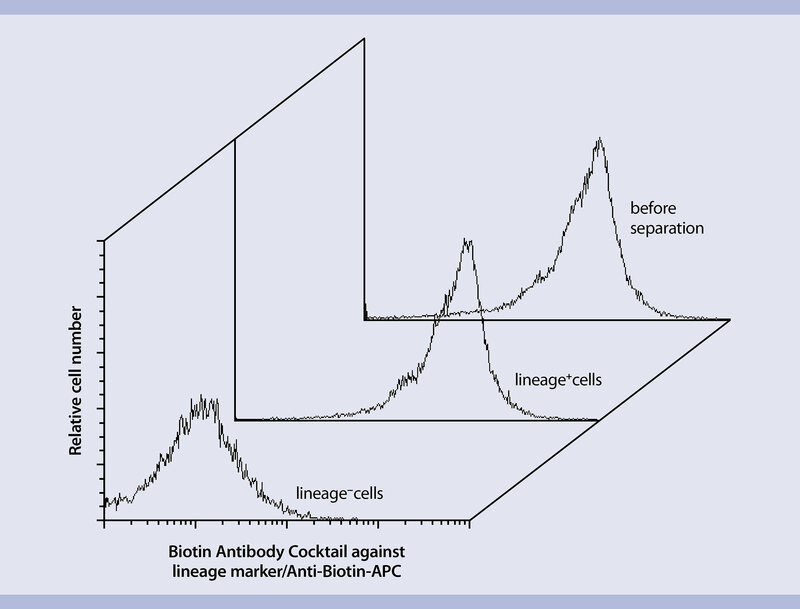 Isolate mononuclear cells by density gradient centrifugation using Ficoll-Paque™. Follow the Ficoll-Paque protocol from the data sheet below. Transduce the lineage marker-negative cells with a retroviral or lentiviral vector, either directly after MACS® enrichment or after pre-stimulation culture in appropriate cell culture medium supplemented with cytokines such as SCF, TPO, FLT-3L and IL-3 and IL-6.